Looking for something a bit cooler than average in which to take the kids to basketball? Volkswagen has taken its T6 Multivan and added a bit of pep in the form of a Black Edition. Which in these shots is actually white. Using the seven-seat Comfortline TDI340 as a base, the Black Edition – which will cost $63,900 driveaway – scores lowered suspension and revised shocks, along with a new anti-roll bar and gloss black 18-inch rims. The Multivan, which rides 20mm lower than stock, also uses speed-sensitive power steering. Its 103kW/340Nm 2.0-litre, four-cylinder turbo diesel engine remains unchanged, driving the front wheels via a seven-speed dual-clutch gearbox and drinking 7.7 litres/100km on the combined fuel economy cycle. It can be had in a choice of six colours (Cherry Red and Candy White are free, and metallics including Acapulco Blue, Tumeric Yellow, Reflex Silver and Indium Grey cost $1720), and it scores a gloss black roof and B-pillars, unique cloth seat upholstery in Titanium Black with contrast-coloured seams. There are also black-trimmed turn signals and ‘Edition’ decals on the side sills and at the rear. The Multivan Black Edition also heralds the return of the distinctive Halifax Maple wood-look washable floor first seen on the dual-tone Kombi 70 limited edition from 2018, while the seats can be rearranged with the aid of an in-floor rail system. The three-seater bench can even be folded forward and reclined into a flat-bed. In the cabin, there’s a high-spec colour multifunction display with Apple CarPlay and Android Auto, while the electric tailgate’s opening height can be set and memorised. The Multivan’s parking sensors can also detect if there is enough space to open the tailgate without hitting anything. The passenger van space is completely dominated by the Kia Carnival, but the T6 holds its own against rivals like the Hyundai iMax. 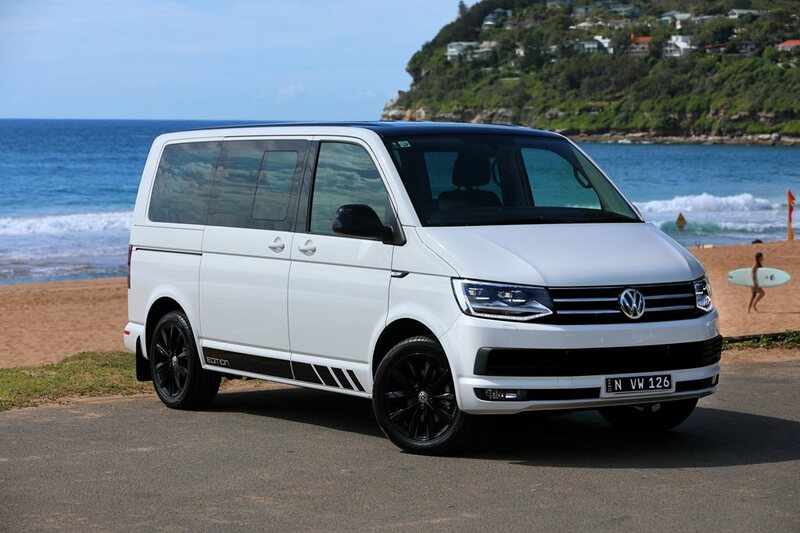 The Multivan Black Edition is limited to 230 units, according to Volkswagen, and will star at the annual Manly Kombi Rally in Sydney in March.